One of the best things about the holidays is getting together with friends and family. And let's face it, there's no better time to host a dinner party then when your house is all decorated for the holiday season! Personally, I think that people's homes feel the most warm and welcoming at this time of year but to make your guests feel even more welcome, you can do one little thing. Make them a place card for the dinner table. I know it sounds like such a simple thing, but when people see their name on something, they feel like they are important. They feel like there was an invitation, a seat and a meal thought out just for them. It will also alleviate any stresses of figuring out where to sit. 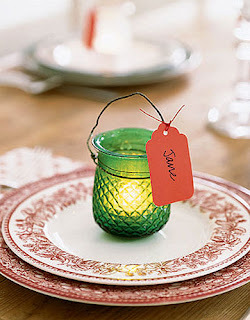 If you can create the place card out of something they can take with them as a parting gift, that's even better. You'd be surprised at how the smallest thing can mean so much. You'll need some silver bells, ribbon and card stock to create this place card. 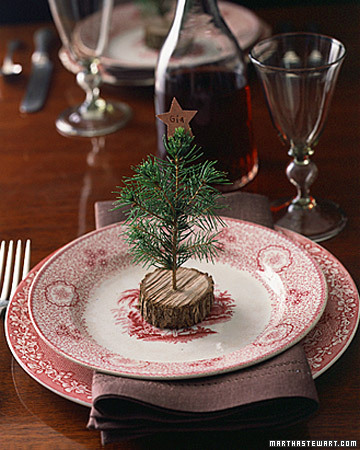 Your guests can later use it as an ornament. Add a little light to your table with these glowing place cards. You can find beautiful old jars at the thrift store and create the wire handle yourself with some 12 gauge wire from a home improvement store. 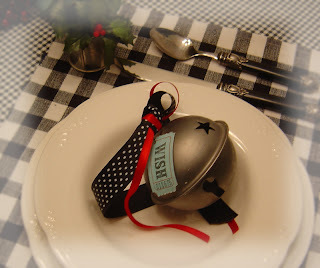 Let your napkin ring double as your place card. Create this holly napkin "ring" with a little string, felt and a mini ornament ball for the berry. Write your guest's name on one of the leaves, and they'll easily find their seat. This miniature guy requires no purchase at all. Find a thick branch in your backyard and cut a few slices off the end to create the wooden bases. Next you'll need to make a little hole in the center of each. If you don't have a drill, you can hammer in a nail and pull it out. Place a drop of glue in the hole and insert your tree (a piece of the leftover branches from the bottom of your tree or one you find outside). Write your guest's name on a gold paper star and use it to top the tree! 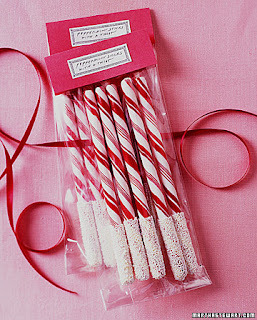 Create your own festive treats by dipping the ends candy cane sticks into white chocolate and then adding sprinkles. You can buy inexpensive polly bags to put them in and create the tag by stapling on cut scrapbook paper. 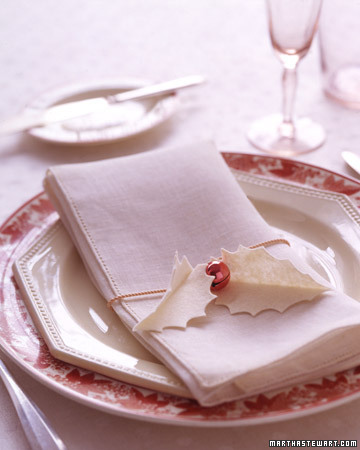 Label each bag with your guest's name and place it on their plate. It will be their parting gift as well as their place card.